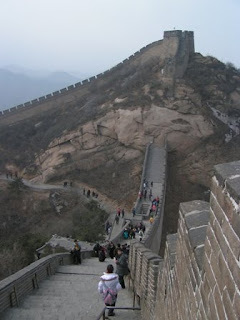 Here are a couple of photos from our tour of the great wall yesterday. I'm not sure what Rob and Charlie would have enjoyed more: the cable car ride up the mountain or Sara's white-knuckled ride up the mountain. In the second pitcure, look for Sara in a white coat and green backpack walking back down the wall. With almost a day before we head for St. Louis, we received our in China travel itinerary. Most importantly, we learned we will receive Jack, March 1!!! February 25, 2010 Arrive in Beijing @ 4:25 p.m. Stay at Chang’an Grand Hotel). February 26, 2010 Visit Great Wall and Cloisonne Factory. 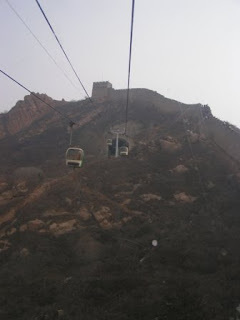 February 27, 2010 Visit Tiananmen Square, the Forbidden City and Hutong Tour. February 28, 2010 Flight MU5174 (11:35-13:35) to Nanchang. Stay at the Galactic Inn. Go to Walmart. March 1, 2010 Receive your child in the morning. Adoption registration and notarization in the afternoon. March 3, 2010 Visit Teng Wang Pavilion. March 4, 2010 Visit Jiangxi Provincial Museum and Bayi Park. March 5, 2010 Receive all the documents. Flight CZ3626 (17:00-18:20) to Guangzhou. White Swan Hotel airport pickup. March 6, 2010 Medical exam for your child at 10:00 a.m..
March 7, 2010 Meeting to prepare the consulate documents at 10:00 a.m.
March 8, 2010 Go back to the clinic to check skin test results. March 9, 2010 Visa appointment. March 10, 2010 2:15 p.m. Go to the consulate to take the oath. March 11, 2010 2:15 p.m. Go to the consulate to pick up visa. March 12, 2010 Flight CA1310 (8:00-11:00) to Beijing. Connecting flight to U.S.A. The year of the tiger began yesterday in China. We tried to celebrate the Chinese holiday over the weekend. I made fortune cookies and asked Mike to write the fortunes for the kids. Hope they make you laugh as much as we did! Listen to mom. Obey your dad. Run in the house...Parents get mad. Throwing candy in the air will turn you into a pandy bear. Give your toys to a stranger; make a friend forever. You will run like a cheetah but walk like a rooster. You will grow monkey tails and eat like whales. Eat bananas. Walk a mile. Drink your milk. Healthy smile! If you use your noses, life will smell like roses. Eat your veggies. Gobble your fruits. If you don't, you'll look like newts. Celebrate the new year. Don't be a fool. Praise be to God. Good luck and much fu. Laugh like a monkey. Be sweet like the honey. All gifts are from God. Share with others your money. It is the year of the tiger. Grab it by the toe. Like the peanut butter; not crunchy but creamy. Give thanks to God. And make real all your dreamy. Roses are pink, and hearts are purple. You are beautiful, I think. Except when you burple. With only eleven days until we leave for China, you would think I'd have more important things to do than post a sugar cookie recipe! Not promising I won't leave this recipe for another, but this is currently our favorite. I leave the dough extra thick so that they are easier for everyone to decorate. The royal icing makes lots and the egg whites are cooked. I don't like the taste of meringue powder so it is worth the extra step. This isn't the most flattering picture, but I wanted to document the Valentine cookies Charlie decorated for himself and Mike. Rob already licked the icing off so I'm not sure who decorated his. Combine and cook over simmering water to 160F. Add pinch of salt. Whisk eggs with mixer on med-high to soft peaks. Beat in 2 tsp lemon juice and 5 cups powdered sugar, 1/2 cup at a time. Beat in 1 tsp vanilla and 1/4 tsp almond extract. Add water or sugar to reach desired consistency. This post is for our family members in warmer places. Hope it makes you dream of snow as we dream of tropical days! As the date to leave gets closer, I’ve been generating more and more lists. This is my latest. It is a little different. None of the thoughts are my own. They are taken from specialists and parents who have done this before. I thought it was important to lay them out there for family and friends before Jack comes back. Unless it is essential to the story, please don’t refer to Jack in anyway different than Rob or Charlie. You wouldn’t say, “He’s my Caucasian, biological grandson (brother, nephew, etc. ).” So please don’t refer to where Jack came from or that he is adopted. He’s no different than Rob or Charlie. It is NOT OK to refer to Jack’s biological parents as “real” or “natural” parents. They SHOULD be referred to as “birth” parents. And, unless this is a conversation Jack starts, it really isn’t something that should be entering our conversations. If someone happens to use language as mentioned above, especially in Jack’s presence, please politely correct them. Parenting – There’s a lot to be said on how formative the first three years of life are. Jack’s been dealt a pretty rough hand. The first year is when we learn the basics: who mom and dad are, and lots and lots of other REALLY IMPORTANT STUFF. Jack was in an orphanage that year. We know that the second was spent with a foster family. Although we assume that he is receiving the love and nurture he should, we really don’t know what his circumstances are. Throw in the fact that he is now coming to an environment totally different than anything he is used to with strange looking people everywhere. Mike and I are going to be working very hard to give Jack all the things he missed. Most children given his early life circumstances will enter families with bonding, attachment, and sensory depravation issues. These are things that can be worked through, but our parenting may be a little different this time around. The first thing Jack needs to learn is that I am his mom, Mike is his dad, and it is our job to permanently meet his needs. We also ask that you follow these guidelines to help Jack transition as easy as possible. Our house is where Jack will learn who Mike and I are and what it means to be his mom and dad. Until we know that he understands, we will be bunkering down. It may be a while before we want even our family members to come over. (We do want to share our experiences with you. We hope you check here frequently to see how Jack's doing.) Please do not take this personally. We just want Jack’s transition to be a smooth as possible. When you do meet Jack, please play with him, talk to him, and let him know how wonderful he is. But PLEASE DO NOT PICK HIM UP. If he wants to be picked up, lovingly help him find his mom or dad. We need this to happen until we know that Jack knows the difference between his parents and the rest of the world. This is kind of repeating, but up until now Jack has learned that moms and dads are replaceable. We need you to do everything you can to help support us in showing him that this mom and dad are forever. Please don’t worry, just pray. We have no doubt that God specifically chose Jack for our family. We’ve got the Big Guy backing us. Things may seem different at first, but we know this is what we are supposed to be doing. And we cannot wait to start the journey! Your support means the world to us. Thanks for taking the time to read this lengthy request!